In 2016, Serco established a strategic alliance with market-leading deployable healthcare providers to deliver capability for the Australian Defence Force to rapidly respond wherever scalable healthcare is needed: overseas, in remote areas or for local emergencies. Under the alliance, Serco Australia will deliver integrated logistics management solutions, while strategic partners Global Defence Solutions and GE Healthcare will provide world-leading shelter innovations and medical technologies. Managing Director of Serco Defence, Clint Thomas AM CSC, said: “Our partners are all recognised leaders in their respective fields, and I am delighted we are partnering in this important program. excellence in logistics, deployment and operational support. EHL Group Australian Director, Michael Byrne, said: “EHL Group are pleased to be part of this innovative and dedicated bid team where we can design and provide leading edge utility system solutions to support the robust and efficient outcomes required by this project”. SERCO has more than 50 years’ experience in providing critical support services to defence forces around the globe. 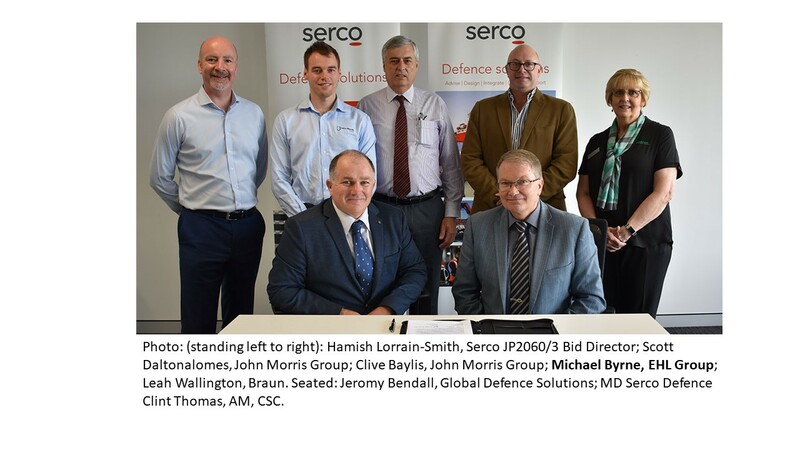 In Australia, Serco provides logistics support for more than 100 Australian Defence Force bases and barracks, despatching 10,000 consignments and maintaining 30,000 pieces of medical equipment each year. Throughout the Middle East Region, Serco delivers a broad range of logistics and base support services to ensure the critical effectiveness of ADF missions within the region. From 1 July, Serco will support the ADF through the provision of National Garrison Health Services (NGHS), providing essential defence support services across more than 50 bases in Australia. The ADF plans for its deployed trauma service to meet NATO performance targets including surgery in the first two hours where wounds threaten life, limbs or eyesight. 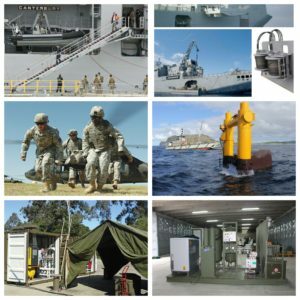 Continual improvement of ADF deployable health care (DHC) services is a goal of Defence’s current purchasing projects known as JP2060 Phases 3 and 4. With a price band of $250 million to $450m, JP2060 Phase 3 will replace current DHC capability with a modernised, integrated system to enable clinicians to deliver “best practice’’ military medicine. The system will cover primary, secondary and specialist care from the point of injury through to evacuation and include advanced diagnostics, surgical capability and allied health. It is to be used at home and abroad for exercises and war fighting along with humanitarian assistance and disaster relief. The new system will incorporate hard and soft shelters, medical and dental equipment, supporting infrastructure (water, electricity and waste disposal) and logistics support such as warehousing, maintenance and training. The Defence Department calls this a “turnkey’’ approach that is “a conscious shift away from a prescriptive tender requirement” towards a “holistic” solution that takes the military’s needs as a starting point. The bid winner will design, deliver, maintain and upgrade equipment over a 15-year period. The system will need to be modular and scalable to meet operational needs and keep up with changing technology and clinical practice. While the bid winner will maintain and service some of the equipment, the DHC will continue to be staffed by personnel from all three Australian services — mostly the Army and Air Force. Defence is evaluating Phase 3 tender submissions and is expected to choose two candidates for further examination. Defence is seeking a fully integrated DHC (Deployable Health Care) capability to provide the Australian clinical standard in a deployed hostile environment as well as ensuring care concepts and equipment stay current. Medical and dental equipment traditionally has a five to seven-year technology life cycle. In the past, Defence has been stuck with legacy equipment that hasn’t kept up with changes in medical best practice. In Phase 3, Defence wants to re-equip its three field hospitals — two army, one air force — that can be set up and dismantled in a matter of days. Each hospital can include two operating theatres, four intensive- care beds, a ward of around 20 beds and ancillary services such as x-rays, CT imaging, laboratory diagnostics and dental services. Phase 3 will also replace medical equipment carried in aircraft, helicopters and army ambulances including protected vehicles such as the Bushmasters. Throughout New Zealand, Australia, & the South Pacific, EHL Group can provide turnkey solutions to meet the complex & exacting safety, environmental, performance, & cost-effective standards demanded by industry.